Mince pies have been eaten at Christmas time in Britain for hundreds of years. Medieval mincemeat in "Old England" was quite different from the mincemeat we're generally familiar with today. Back then it contained as much meat and suet as fruit, and only a touch of sugar. Today traditional mincemeat still contains meat, but fruit is now the dominant ingredient and the sweetening has increased by a large measure. 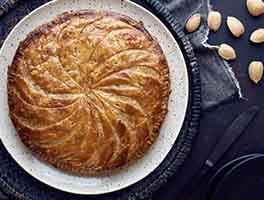 It's now usually made with beef, rather than the medieval mutton. In the north country of New England you'll find it often made with venison and sweetened with maple syrup. Our version is a typical New England mincemeat. It will make 2 quarts, enough for 2 1/2 to 3 small tarts or three 9" pies. The mincemeat is best when it's made several weeks ahead of time to allow the flavors to mature. 6 hrs 40 mins. to 6 hrs 55 mins. To make the mincemeat: Trim the meat if necessary and dice it into small cubes. 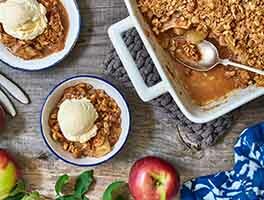 Pour the cider into a large saucepan or small kettle and add the sweeteners and spices. Add the meat and bring this mixture to a boil, then turn down and simmer for about 2 hours, or until the meat is tender. Skim any foam that comes to the top during the first hour of cooking. After 2 hours, turn off the heat and remove the meat with a slotted spoon. Add the currants, raisins, cranberries and lemon rind and juice to the hot cider/broth mixture. Let these steep while you grind or mince the meat along with the suet, if you're using it. Return the meat (and suet) to the fruit mixture, bring back to a boil and then down to a simmer for about 1/2 hour. Boil off enough liquid so the mixture is thick. If you opted not to use suet, melt and blend in the butter at this point. After the mixture has cooled, add the spirits and nuts, if using. This adds flavor and helps preserve the mincemeat. Cover and store mincemeat in a cool place for 2 or more weeks if you have time. Give it an occasional stir and add 2 or 3 more tablespoons of spirits if you wish. To make a pie: Roll half of the dough to a 14" circle. Fit the dough into your pan, and fill 1 1/2" deep with the mincemeat. Roll the remaining dough into a circle and place on top of the filling. Wet the top edge of the bottom crust, pinch the top and bottom together to seal, and flute the edge. Cut a design or several slits in the top of the pie to vent steam. To make tarts: Roll out your dough and cut the pastry into rounds 5" or 6" in diameter, or big enough to fill the cups of a muffin tin, with smaller circles for the tops. Carefully place the larger circles in your muffin tin. Fill the shells about half full with mincemeat. 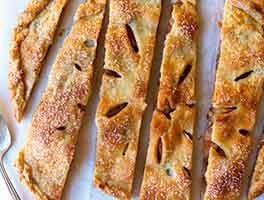 Moisten the rim of the dough with cold water, place the slightly smaller rounds of the dough on top of the filling and, with a fork or your fingers, press them to the bottom crusts. 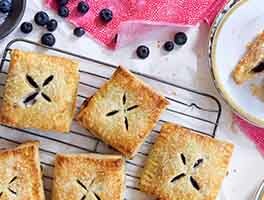 If you wet the rim of the muffin tin before you press top to bottom, the little pies will come away from the tin more easily after they are baked. To bake both pies and tarts: Preheat the oven to 425°F. After you put the pies in the oven, turn the heat down to 375°F and bake the 9" pies for about 35 minutes. 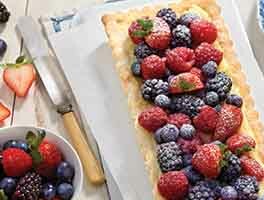 Bake the tarts for about 20 minutes. If they begin to brown too quickly, turn the heat down to 350°F for the final 5 to 10 minutes. Let the small pies cool for about 5 minutes before removing them from the muffin tin. Store, chilled, for up to a week in the fridge, or freeze for up to 6 months. One way to measure the size of your crust is to flip your pie pan over on top of the circle you've rolled. If the dough is bigger all around by 2 inches, it's the right size. If you like, you can fancy up the top by brushing it with a wash made by beating an egg with a tablespoon of water, then sprinkling the top with coarse sugar. I've tried several mincemeat recipes over the last few years, and this one is by FAR the best. My entire family thought it was great, but my dad missed having apples in it - all of the other recipes I've tried had apples, not just cider or juice. If I wanted to add some apples to this how many would you recommend and when in the cooking process would you add them? I am 60 years old and have spent my life eating grocery store mincemeat pies because my mother liked it. It was never made with meat, just fruit. I really didn't care for it. I decided to try this and it's wonderful. Very tasty. But it makes a lot. Can I put it in the crust and freeze the pies? I'm guessing you can, but wanted to ask if there's anything special I have to do? Thanks so much. I made this filling yesterday, and it's now in the refrigerator to be turned into a pie next week. I gave the recipe four stars, but would have liked to have given it three and a half and been allowed to select "Maybe" on a recommendation. The flavor is outstanding, no denying that. But the mincemeat is grainy or gritty. I practically liquified the suet and cider-boiled meat in my Cuisinart, so I don't think this is an issue of underprocessing the beef. Has anyone else had this problem? Will the meat and suet "melt" as I cook the pie? Is there anything I can do in the future to avoid this problem? I grew up eating mock mince meat pies and always wanted to try the real thing. This was excellent. I started with ground deer meat and only boiled in cider for a half an hour. Had to substitute nutmeg for the mace, cherries for the currants, apples for the cranberries, and Bourbon for the brandy. Otherwise, I followed the recipe and made the first pie the next day. It was delicious and even my wife, who doesn't really like venison, and was "confused" by a dessert with meat in it, came back for seconds. Will make again! 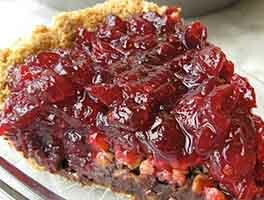 Wonderful recipe and different in that cranberries are used in place of traditional apples. The flavor is incredible and only improves when it is allowed to cure a few weeks.Commercially available venison is a bit pricey so I used a lean cut of beef (London Broil) with great success. The only change I made was to add the juice and zest of half a lemon and orange but I've made it also according to the original, it's very good. I chose brandy for the spirit used as it ( in my opinion), lends in the support of bringing all the flavors together rather than masking them. I have never in my life enjoyed mince until I made my own and I consider myself fortunate to have stumbled upon this formula. I've made mince pies for friends who know an love mince pies and the majority have expressed that this is the best they've either have had or have had it a long time. 5 stars is all I can rate but add a few on for me !